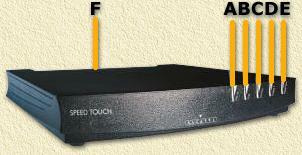 Here you will find, briefly, what the LED's of your Alcatel Speed Touch Home suppose to indicate. This can be usefull for solving problems. This is the modem type KPN delivers with both the ISDN Ethernet and Analog (PSTN) Ethernet variants for MXStream. I heard that the Belgian SkyNet offers this modem aswell (thanks Ludo!). Note: the ISDN and PSTN (analog) modems may look alike, but are definitely different on the inside! A LAN Data flow from/to the Ethernet connection on the back of the modem (so basically from and to your computer). This led is GREEN. No data flow from or to your computer. This does not need to be an error. See Led F.
B Line TX Data is being transmitted to ADSL. This led is GREEN. No ADSL transmissions. C Line RX Data is being received from ADSL. This led is GREEN. No ADSL reception at the moment. D Line Sync ADSL initialization successful - you are now connected to ADSL. This Led is GREEN. ADSL line synchronization started (remains blinking if the connection to the splitter is not OK - check it!). E Power/Alarm Modem ON (Power ON). This Led is GREEN. Modem "boot" (some RED flashes, the last one is ORANGE and finally it shows a GREEN light). Modem OFF (Power OFF). F LAN Active A proper Ethernet connection between modem and PC. (Which does ONLY mean that the cable is OK). This Led is GREEN. No Ethernet! Check your cables!